Climate Common Sense: They seek it here,they seek it there,Trenberth seeks it everywhere! They seek it here,they seek it there,Trenberth seeks it everywhere! 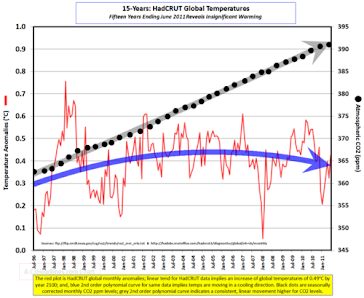 That damned elusive missing heat has plagued climate "scientists" for years causing a major discrepancy in global heat balance calculations. Now it is conveniently claimed that it has been hiding in the deep oceans ready to leap out and cause rampant global warming some time in the future. Real scientists of course who find the data doesn't agree with their theories re-examine their theories and do not assume automatically that the real data is "lurking" somewhere else. This deep oceans conjecture has been invented to explain why the "settled science" cannot explain the lack of global warming over the last decade with increasing CO2 emissions. This new theory of course must be right because the "scientists" have modeled it using the deluxe five simulation model for extra greenwashing and amazingly they got exactly the correct result and the planet is once more plunged into mortal danger. Global warming is temporarily on hold as the deep ocean currents and circulations absorb the sun's heat before releasing it finally, scientists said on Sunday. The study conducted by scientists at the National Center for Atmospheric Research (NCAR) and the Bureau of Meteorology in Australia was published in the Sept. 18 issue of the journal Nature Climate Change. The last decade saw an incessant growth in greenhouse gas emissions which ideally should have increased Earth's temperature. However, Earth's temperature did not increase vastly. Where was the "missing heat" going? 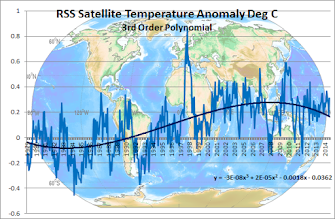 To find out the mystery, Gerald Meehl, lead author of the study that revealed the connection between global warming and temperature hiatus caused by ocean's heat absorption, and scientists at the NCAR in Colorado ran five simulations on a computer model that studied the complex interactions between the atmosphere, land, oceans and sea ice. The study revealed that temperature has already increased by several degrees in this century and will increase more in the coming days but the hiatus period will interrupt the increase. During this period, the missing temperature will lurk inside the deep ocean. You and me being electronics people understand the principle of negative feedback. Increases in temperature cause an increase in ocean evaporation, causing more clouds. More clouds reflect more incoming infrared radiation back out into space, stabilising the temperature. We understand it, so why don't we ever hear the 'climate experts' mention it? Oh, I forgot. It doesn't fit their hysterical The Sky Is Falling (So We Want More Government Funding For Research) claims, does it?